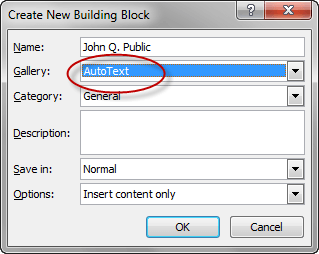 For several of the past iterations of Word, Microsoft has had an AutoText feature that allows users to capture a piece of text and then to use it over and over again in other parts of their documents, or even in other documents. Microsoft has added to that feature by including something it calls, Quick Parts, which are in essence, still AutoText, but offer users a little more flexibility. In most cases you can go with the default options, though if you wish you can change them to suit your purposes, then click on the Ok button. Note: The Name of the Quick Part you are creating, defaults to the first line of your text. Clicking on the Quick Parts window with your text in it causes your text to be inserted into the document at the current position. 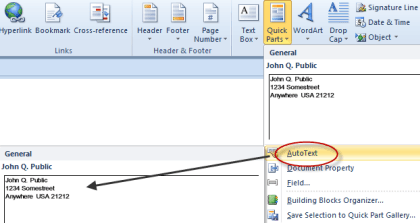 There’s an even faster way to get your Quick Parts text into your document though; move to an empty spot, and start typing the same text you have saved as Quick Parts text, you should get a little popup showing you that Word recognizes that you’re trying to type in your Quick Parts text. In this case, all you have to do is press the Enter key and Word will fill in the rest of the Quick Parts text for you. Note: You can also type in just a couple of the first characters of your Quick Parts text, and then press the F3 key, and Word will insert the Quick Parts text it thinks you want. 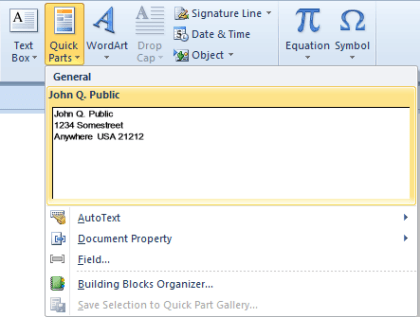 This is the quick part of Quick Parts, by clicking just one icon, you immediately see the text you’ve captured and can insert it with just one more click, or have it inserted automatically when it recognizes what you’re trying to type. Clicking on where you see your saved text causes the text saved to be inserted into your document just as with Quick Parts. 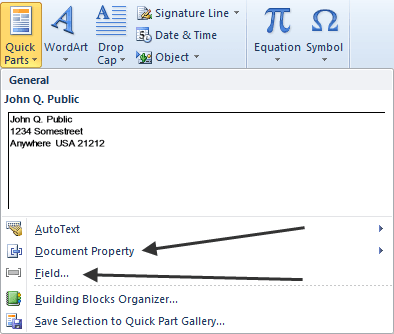 Document Property allows you to insert text with a predefined heading into your document; to see how this works, click on it, then choose one of the available titles from the popup menu. Then, clicking anywhere else in our document causes it to look like regular text. 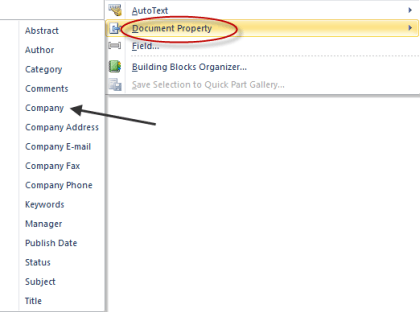 But, the next time we need to type in the name of our company, we can instead click on the Quick Parts icon, choose Document Property, and then Company from the drop down menu, and the company name will be inserted into the document. 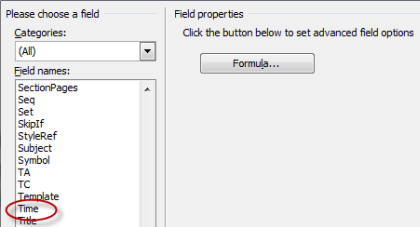 The other option, Field… is used to insert predefined Word elements into your document; for example, if you wish to have the current time inserted in your document, you would click on Quick Parts, then choose Field… then choose Time from the category window. 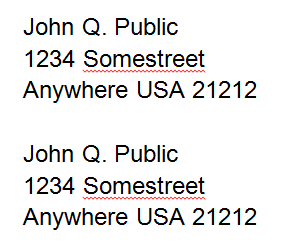 The current time will then be inserted into your document. 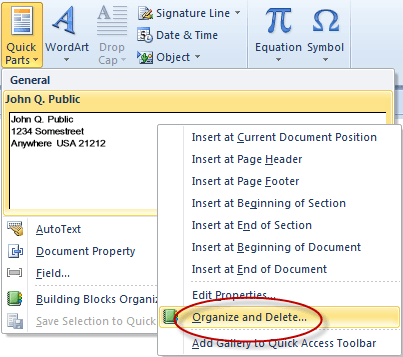 Then click on the Delete button at the bottom of the Organize and Delete PopUp menu. Quick Parts and AutoText are most useful when you find yourself retyping some bit of text over and over again, especially if it’s cumbersome typing, such as long numbers or hard to spell names or places.